1837: A public meeting was called in July to discuss the possibility of establishing a county infirmary, but nothing came of it . 1838: A public meeting was held in Dorchester on 21 August, with wealthy banker Robert Williams, in the chair, where agreement was reached. Dr. Jackson and the Rev. J. Templar were appointed provisional Secretaries, and a committee was formed to raise funds for a new county infirmary . 1839: Another public meeting took place on 12 March, with county magistrate John Floyer presiding, at which the name “Dorset County Hospital” was adopted. Robert Williams donated a freehold property valued at £1,500, situated in Back West Street (later Princes Street) for the new hospital. In addition, the Earl of Shaftesbury donated a small portion of adjoining land . 1840: In February, the Provisional Secretaries advertised for builders to tender for the work of building the first part of the hospital, the North Wing . The foundation stones were laid in May . 1841: The building works were completed in March  and on 15 April the first medical staff were elected: they comprised a consulting physician and a consulting surgeon, a physician, two surgeons, and a house apothecary . The hospital opened without fanfare in early May, but it was not until 17 May that it received its first in-patients. In all, there were 20 beds . The census on 6 June recorded the presence of the house apothecary and the matron, along with three domestic staff and twelve patients . 1844: At a Governors’ meeting on 11 April, they resolved to complete the final stage of the building work . 1845: On 21 July, Parliament authorised the creation of the Southampton and Dorchester Railway. A number of labourers were involved in accidents during the construction of the railway, and they were treated at Dorset County Hospital . The line was finally opened in June 1847. In November 1845 nearly the whole of the central part of the building was completed, at a cost of about £3,500 . 1846: Arthur H. D. Acland, the first chairman of the management committee, presented the hospital with a sun dial . 1847: Hospital trustee and benefactor Robert Williams died on 10 March. Williams was a wealthy banker who had held seats in Parliament since 1802. In 1812 he had taken over his father’s constituency of Dorchester, from which he retired in favour of his own son in 1834 . In his will he left £1,000 to Dorset County Hospital . 1848: Arthur H. D. Acland, donated a small wooden chapel which had previously been attached to his house in Dorchester (up until then, a room in the hospital had been used as a chapel) . 1849: The first outbreak of cholera in Dorchester began with the death of 21-year-old William Dufall in Mill Street, Fordington on 21 August. On 4 September a Board of Health was established for Dorchester and Fordington . Dr. Charles Cowdell, physician to Dorset County Hospital, wrote to the London Medical Gazette on 22 December describing examinations carried out by him and his colleague, Mr. Curme, surgeon to the hospital, which confirmed Dr. Brittain of Bristol’s recent discovery of microscopic organisms in the evacuations of cholera patients . By mid-October, the local press were able to report that cholera had disappeared from Dorchester, although cases of scarletina and small pox were prevalent . 1851: On the night of the census, 30 March, the hospital accommodated the house apothecary, the matron, the resident curate, four nurses, four servants, and 36 patients . 1854: A second outbreak of cholera in Dorchester. In November, Florence Nightingale and a group of 38 volunteer nurses arrived at Scutari, in the Crimea. 1856: George Bankes, one of the local members of Parliament, died, leaving a bequest of £500 to the hospital. His widow undertook to double the amount on condition that it be used to build the South Wing, to be called the Bankes Wing . 1858: The Medical Act 1858 came into effect on 1 October, requiring doctors and surgeons to be registered . 1859: The Bankes wing completed at a cost of about £1,600 . 1861: The census on 7 April finds the hospital accommodating eleven staff and fifty patients . 1862: The wooden chapel was replaced by a permanent one (built by Mr. Wellspring, again from the original designs by Ferrey). This permanent chapel was wholly financed by Mr. Acland’s relative, Robert Williams Junior, son of the original land donor. The new chapel was dedicated on 9 April 1862 by the Bishop of the Diocese . 1863: Dorset County Hospital received its first nurse trained by the Nightingale Fund . 1866: The Prince of Wales became patron of the hospital . On 14 April, one of the original trustees of the hospital, Henry Charles Sturt, died aged 71. He was the member of Parliament for Bridport 1817-20, for Dorchester in 1830, and for the whole county 1835-46 . 1871: Another census took place on 2 April. This showed that there were 57 patients and 19 members of staff and their families . 1875: Mr. Barton Smith, who had been appointed house surgeon the previous October, resigned his post in January because he objected to the Management Committee’s insistence that he dine with the matron, Miss Feek . 1878 (approx. ): An annex was attached to the North Wing, providing more space as well as accommodation for the nurses in charge of the wards. 1880: The hospital architect, Benjamin Ferrey died 22 August, aged 70 . 1881: The census on 3 April records that there were 47 patients in the hospital and 18 resident staff (and their families) . 1885: A porter’s lodge was built at the hospital . 1887: John Floyer, the last of the original trustees, died on 4 July, aged 76 . 1891: The census on 5 April recorded 17 staff and 36 patients . 1893-96: Other improvements were made including re-laying the entire drainage system, installing hot water pipes in the corridors and wards, laying wooden block flooring in the lower passages, re-building defective chimney stacks, repairing the roof, supplying new furniture to the matron’s and nurses’ rooms, and introducing electric bells to the wards . 1896: Charles S. Prideaux became the hospital’s first Honorary Surgeon Dentist . 1898: Charles Hansford, one of the vice-patrons of the hospital, paid for a sheltered alcove adjoining the South Wing . 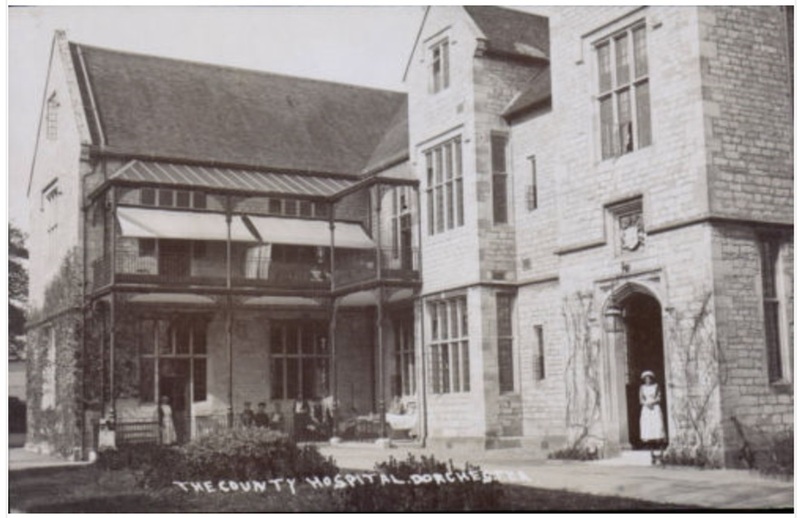 1899: The accommodation for out-patients was improved, with a new, dedicated entrance and a re-arrangement of the rooms used for the surgery, dispensary, and waiting room . 1901: The census on 31 March recorded 20 resident staff (and family members) and 35 patients . A complete system of fire hydrants was installed, a special water main being laid from Princes Street, through the back yard, and up to the second floor of the building . 1902: The Midwives Registration Act was passed. Capt. John Edward Acland, then chairman of the Committee of Management, produced A Short History of the Dorset County Hospital, telling the story of how the hospital had developed over the previous sixty years . 1903: A new operating theatre was opened by Sir Frederick Treves on 23 February . Treves was an eminent Royal surgeon and had performed a pioneering appendix operation on the hospital’s patron, King Edward VII, in 1902. 1911: The census on 2 April recorded that there were 21 resident staff and 32 patients. By this time the main hospital building had 37 rooms . 1914: The First World War started on 4 August. 1918: In March, Charles T. Carter celebrated holding the post of dispenser at Dorset County Hospital for 48 years . Armistice was declared on 11 November, marking the end of the First World War. 1927: A new ophthalmic ward was presented to the hospital on 17 February as a memorial to William Watkins, who was for many years honorary secretary of the Society of Dorset Men in London . 1939: Britain and France declared war on Germany on 3 September. 1941: The hospital delayed celebrations of its one hundredth anniversary due to the war . In April parishes across Dorset collected 10,600 eggs (and £81 in cash donations) to help the hospital following the introduction of food rationing . 1944: In February the Government published a White Paper proposing the establishment of a National Health Service “open to all and free of charge” . 1945: Victory in Europe Day on 8 May followed Germany’s surrender to the Allies. 1946: Mr. E. J. Stevens, vice-chairman of the hospital’s management committee, condemned the Government’s plans to take over ownership of voluntary hospitals as “barefaced robbery” . 1948: National Health Service Act 1946 came into effect on 5 July. Sherborne Mercury, Monday 10 July 1837, page 1; Sherborne Mercury, Monday 17 July 1837, page 1. Acland, J. E., A Short History of the Dorset County Hospital, 1902, page 4. Sherborne Mercury, Monday 27 August 1838, page 3; Acland, pages 4-5. Sherborne Mercury, Monday 25 March 1839, page 2; Salisbury and Winchester Journal, Monday 11 February 1839, page 3. Salisbury and Winchester Journal, Monday 3 February 1840, page 4. Salisbury and Winchester Journal, Monday 11 May 1840, page 3. Sherborne Mercury, Monday 19 April 1841, page 3. Sherborne Mercury, Monday 17 May 1841, page 3. The National Archives, Census, 1841, HO107/294/6, folios 24b-25a, pages 43-44. Sherborne Mercury, Saturday 20 January 1844, page 1. The National Archives, Prerogative Court of Canterbury, will of Robert Williams proved 7 May 1847, PROB 11/2056, folio 384a. Sherborne Mercury, 8 September 1849, page 4. Report of the General Board of Health on the epidemic cholera of 1848 and 1849 (1850), page 155. London Medical Gazette, new series, volume 9, Friday 28 September 1849, page 555. Sherborne Mercury, Saturday 13 October 1849, page 4. The National Archives, Census, 1851, HO107/1858, folios 87b-89a, pages 35-38. Salisbury and Winchester Journal, 2 August 1856, page 3; Acland, page 13. The National Archives, Census, 1861, RG9/1353, folios 60a-61a, pages 45-47. Dorset County Chronicle, Thursday 14 January 1864, page 4. The National Archives, Census, 1871, RG10/2009, folios 49a-50b, pages 21-24. Western Gazette, Friday 5 March 1875, page 7. The National Archives, Census, 1881, RG11/2110, folios 40a-41b, pages 7-10. Western Gazette, Friday 8 July 1887, page 8. The National Archives, Census, 1891, RG12/1652, folios 44a-44b, pages 31-32. Acland, pages 23 and 29. The National Archives, Census, 1901, RG13/2002, folios 9b-10a, pages 10-11. The Times, Saturday 21 February 1903, page 12. The National Archives, Census, 1911, RG14/12384, schedule 35A, pages 1-3 and schedule 36A, page 1. The Times, Saturday 2 March 1918, page 3. Kelly’s Directory, 1927, page 83.. The Times, Friday 18 February 1927, page 16. Western Gazette, Friday 4 April 1941, page 7. Western Gazette, Friday 18 April 1941, page 6. The Times, Friday, 18 February 1944, page 5. Western Gazette, Friday 5 April 1946, page 8.